The Holiday Inn Bristol Filton Hotel, combines an excellent range of facilities for both business and leisure travellers, including WIFI, High Speed Internet Access - Broadband &reg 211 fully air-conditioned bedrooms, two hotel restaurants, bar and lounge plus conference and banqueting facilities (up to 250 people). Our Spirit Health and Leisure Club boasts facilities such as indoor swimming pool, sauna, solarium, gymnasium and onsite beauty therapy. We guarantee an enjoyable stay with a warm welcome, and kids stay and eat free. 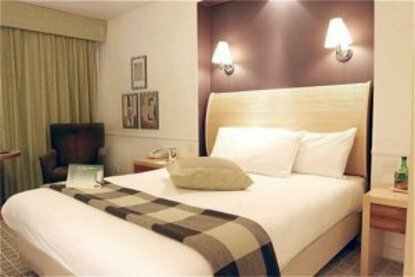 Holiday Inn Bristol Filton Hotel has two restaurants, the Junction and Sampans Oriental, offer tempting dishes from around the world. The extensive Spirit Health Club is also available to our guests, offering a gym and indoor heated swimming pool complimented by beauty therapy. Holiday Inn Bristol Filton Hotel has a state-of-the-art Academy Conference Centre boasting 14 purpose built meeting rooms that can cater for all requirements from training courses, boardroom meetings and conferences to weddings, dinner dances and Graduation Balls.